Whether you're planning a trip, have to travel for work or booked some really sweet gigs that got you on the road, perhaps you might like to know about I bring with me when I travel? I (shockingly) have trouble packing light, so if my trip is longer than a weekend, I'll bring a big purse (for the plane) and check my luggage. 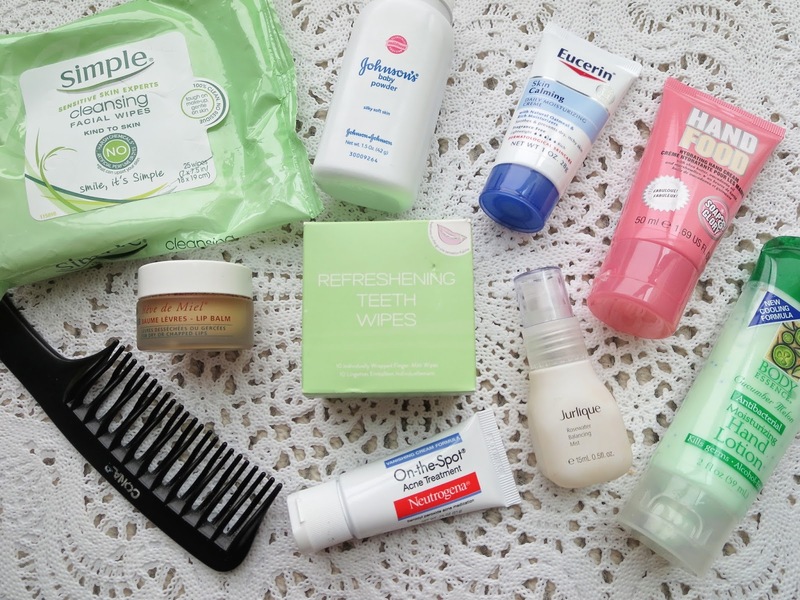 Cleansing Wipes ; MOST ESSENTIAL. 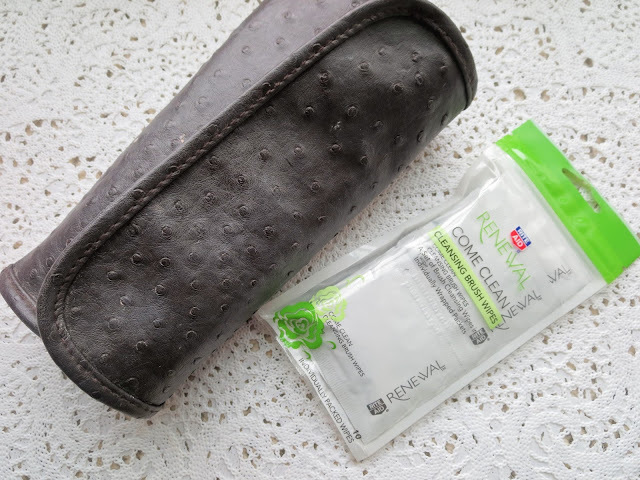 You cannot live without cleansing wipes when traveling because you never know what could happen, and this is just survival girl. You might not have access to a sink or you might have a kid throw up on you a little and the stewardess can't be bothered (true story). This is just bare necessity, to at least remove your makeup or clean up random messes...As much as I love oils & waters, it's just not as convenient for travels. My faves? Simple Cleansing Facial Wipes - I swear I am not paid by Simple nor have they sent me any products, nor do they care about my little blog lol I just really love their products! Hydrating/refreshing spray ; we all know the air on a plane can cause havoc on our skin. Staying moisturized is primordial. I like to keep a hydrating mist to refresh throughout the flight. I got this deluxe sample of the Jurlique Rosewater Balancing Mist, but travel friendly options could be as cheap and simple as the Lush Eau Roma Water or the Caudalie Beauty Elixir or even the Evian Water Spray. *If you don't have anywhere to be right when you land, I like to travel bare face with a nice hydrating mask on, or a thicker moisturizer so then you're just "re-boosting" it when you spritz. Moisturizer ; a logical follow up, I need a little travel size moisturizer in my purse at all times. Between eczema and dry patches, whenever I feel a spot drying up I dab some of this on it. Hand cream ; again : hydration, hydration, hydration. I always keep a small hand cream in my bag like this Soap & Glory Hand Food. Lip balm ; to keep with the moisture theme, cannot forget about them lips! As you know, my favorite is the Nuxe Reve de Miel. Teeth wipes ; yes I know it sounds weird. I found these Refreshing Teeth Wipes in the check out line at Forever 21. I don't exactly see myself brushing my teeth mid flight (though if you're comfortable, you do you!) so I thought this was a great way to keep your mouth fresh on the go! They actually work pretty well! Hand sanitizer ; I know it's supposedly bad for you, but I don't regularly use it. I just figure in a plane there's bad and then there's worse, you know? I like to keep my hands "clean" if I'm going to eat or anything. To make sure you're not drying your hands out you can find moisturizing ones like this antibacterial lotion. Spot Treatment ; since I like to travel without makeup, I like to keep a spot treatment on hand to treat existing breakouts and prevent new ones from forming (I swear I can feel them popping up every time I fly). "Just in case" samples ; I personally like to transfer my well loved items in suitable for travel containers, but usually leave those in my checked luggage. 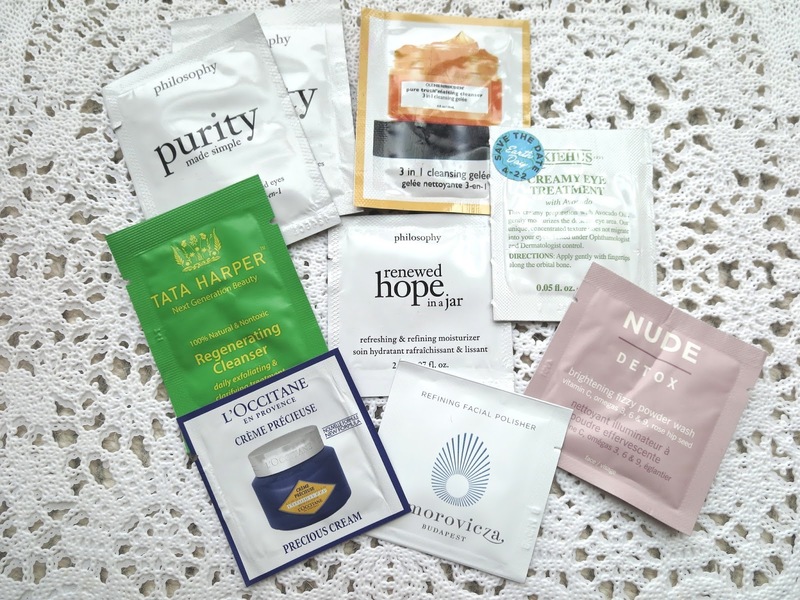 I like to shove a few emergency samples in my carry on, in case things go awry (ex: connecting flight is delayed or cancel and you have to go without your luggage for a night or you know, the nightmares of flying). So all your typical free with order "paquet" samples. Baby Powder ; Okay maybe not an essential, but if I have it on hand I like to bring it for the same reasons mentioned above. Baby powder can serve as emergency dry shampoo and deodorant (I leave both those things in my luggage). Sheet masks & eye patches ; A nice hydrating mask right after your flight is a great way to do some damage control. 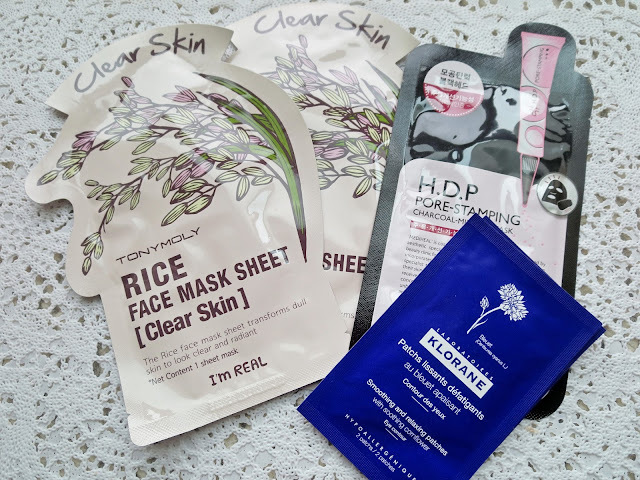 I love sheet masks because they are really effective and take no space, they look freaky but it's a small price to pay! I like to bring a moisturizing and detoxifying ones to keep my skin in check throughout my trip. To stay in the "sheet" theme, eye patches are another great thing to bring. 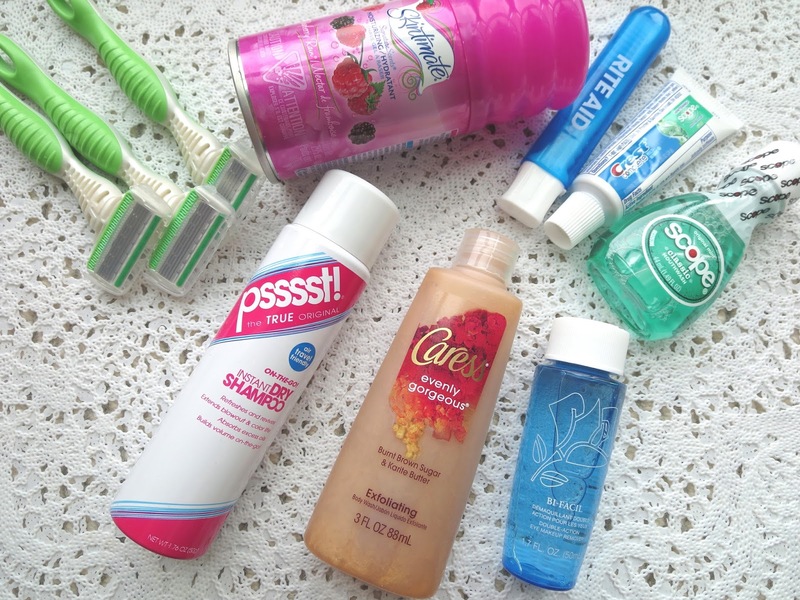 Traveling can be exhausting and these will keep you fresh faced and you guessed it HYDRATED! Yay! Travel bottles ; like I said, I prefer transferring my products in bottles. I do check my luggage so I don't need it to be that small, but for space efficiency and to minimize leaks, spillage, loss, it's just how I roll. So my cleanser, toner, moisturizer, shampoo, conditioner ; transferred. Hair Straightener ; Most hotels have a hair dryer, and if they don't you can always manage with just a straightener. If you're lucky and your hair is mostly naturally straight you can bring the baby travel size, but you might want to make space for the big one! 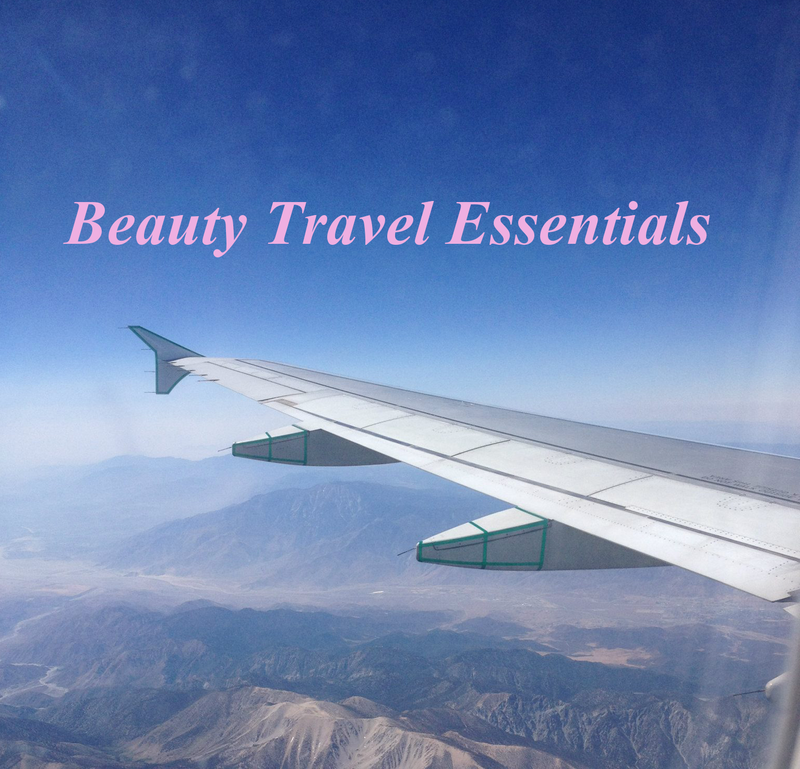 **If you're worried about spillage or transfer or just want to bring a carry on without worrying about too many liquids, other good options are : Solid cleanser (ex: Biore, Neutrogena, Clinique), Solid shampoo (Lush). Tarte Showstopper palette ; as I mentioned in my review (here), this is why I got this one in the first place. 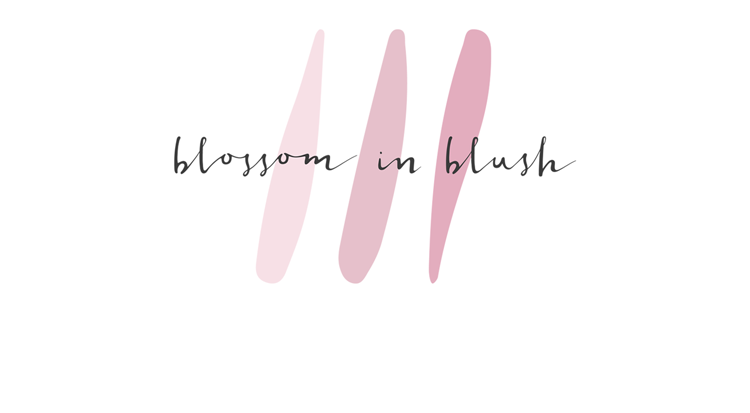 Any palette that offers all-in-one or has versatile shades (as in you can use some of the shadows for bronzer, highlight and blush) is a must! This one has at it all and takes little to no space. For the rest I usually bring my full size products but try to limit myself; one or two lipsticks, primer (eye & face), concealer, an eyeliner, mascara, a setting powder and setting spray. I will usually transfer my foundation because more often than not, it is in a glass bottle that is prone to breakage and leaks. Since I do mix 2 foundations, I found these little pill containers and I can just pour out what I need in them. 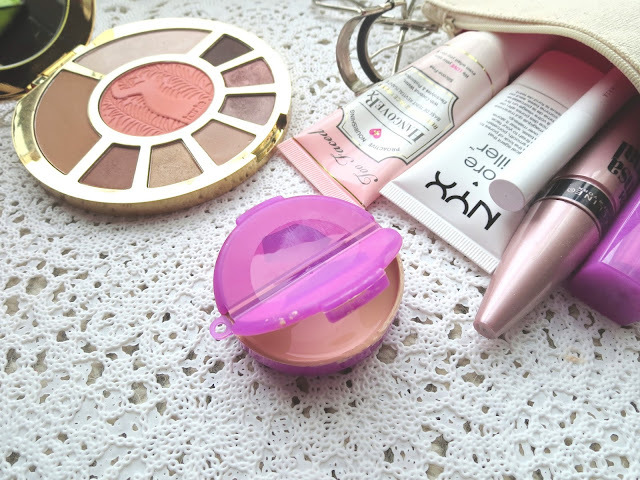 You could also use contact lenses cases for this, and switch your combo to loose powder and foundation! Makeup brushes ; I try to bring only the essential and fit them in a little carry case. I also like to bring brush wipes to keep them clean since I'm not going to deep clean them while on vacation. Even the daily spray I avoid cause I usually don't have anywhere to let them dry out. Nail polish & remover ; this is not ideal cause they could break/spill, but if you're wise and put them in a ziploc bag and packed around a lot of "padding", you should be good! Hair ties and bobby pins; if you think you brought enough, bring MORE! Cotton pads & cotton swabs ; I just bring the amount I need in a little ziploc bag. Yes I count them and I don't bring one more than what I need. Just kidding I just shove a bunch in there. Tweezers ; I forgot them once and it was a nightmare. NEVER AGAIN. Had to buy new ones ASAP. I think that's everything! God, I hope cause that's all I'm bringing! Did I get everything? Now you know what packing with me is like haha Anything I forgot? What are some of your essentials? ?